The Gunda Werner Institute at the Heinrich Böll Foundation, the catalyst organisation affiliated with the German Green Party, asked authors who have recently fled to Germany to escape the conflicts in their home countries for their wishes. “Writing on” was their answer – the starting point of the eponymous project. Leaving home does not only mean leaving a specific culture or lifestyle behind but also language, identity and a career. The project wants to open the door into the German literary economy and provide a one-on-one professional and literary exchange between the authors writing for the project and their German colleagues. The authors and organisers of “Writing On” will be guests at the Goethe-Institut Toronto throughout 2018. In conversations with Canadian writers they will touch on issues and difficulties authors seeking refuge in Germany are facing in re-establishing themselves and their voices. It will ask questions about literary exchange and cultural identity, dreams, hopes and opportunities, and practical assistance. Readings in English, German, Arabic, Farsi. Discussions in English. Texts (in German, Arabic and Farsi) can be found on the main portal weiterschreiben.jetzt; the Goethe-Institut Toronto is commissioning English translations for this series in Canada. "Weiter Schreiben. A portal for literature and music from conflict areas" is a project by the WIR MACHEN DAS/wearedoingit e.V., supported by the Capital Cultural Fund and the Goethe-Institut, in collaboration with the Gundad-Werner-Institut at the Heinrich Böll Foundation and the Allianz Kulturstiftung. Culture talks @ Goethe: "Cooking the Heart of a Wolf"
We bring together Tanja Dückers (Germany) with writer and journalist Ahmad Danny Ramadan, who fled Syria and now lives in Vancouver. Rabab Haidar (Syria) will join from Damascus via Skype. They will read from their recent novels. Culture talks @ Goethe: "Who will return my Home?" We welcome writers Galal Al-Ahmadi (Saudi Arabia/Yemen), Noor Kanj (Syria) and Svenja Leiber (Germany) to encounter Vancouver-based author Ayelet Tsabari. We are hosting writers Mariam Meetra (Afghanistan/Germany) and Antje Rávik Strubel (Germany) alongside renowned Afghan-Canadian director, actress, journalist and author Nelofer Pazira for a conversation on remembering culture(s). Senate of Canada I am delighted to extend my warmest greetings to everyone attending the “Writing On” series of readings and discussions at the Goethe-Institut Toronto in 2018. I especially welcome the international authors who have come to Toronto from Asia and Europe to share their voices and their stories about second chances and “writing on” after changing place. I myself arrived in Canada via Germany—as a German teacher trained at the Goethe-Institut New Delhi—and remember well both the challenges and opportunities new beginnings bring. Thank you to the Goethe-Institut for entering into this intercultural and multilingual conversation with Canadian artists and audiences, and for sharing the global experience of flight and migration. Please accept my best wishes for enriching exchanges and lasting encounters. 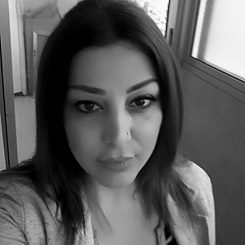 Rabab Haidar Rabab Haidar lives in Damascus and studied humanities and English literature at Tishreen University in Latakia, Syria. After graduating, she worked as a flight attendant and security consultant for Gulf Airlines, then until 2011 as sworn translator for English and Arabic at the Ministry of Justice. She translates poetry from English into Arabic and vice versa and writes as a columnist for various newspapers and magazines. Her first novel “Land of Pomegranate” was released in 2012. Her second novel “Rabbit Hole”, dealing with the revolution, feminism and minorities, has yet to be published. She is a member of the Syrian Women’s Network. In Toronto she will read from her as yet unpublished fantastical novel “Cooking the Heart of a Wolf” about wolves, and women eating men. Tanja Dückers German writer Tanja Dückers was born in West Berlin in 1968. 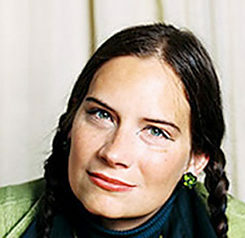 She studied art history, American studies and German and has lived in the USA, Amsterdam, Barcelona, Prague and Krakow. She has published numerous novels, audio plays, poems and essays, including the novel “Celestial Bodies” about the topography of a family memory, from which she will read. As a journalist, Dückers writes for the weeklies Die Zeit, Spiegel, et al. 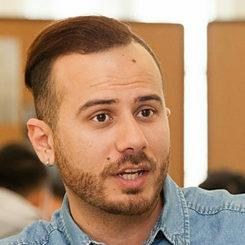 Danny Ramadan Ahmad Danny Ramadan is a journalist with bylines in the Washington Post, The Guardian and Foreign Policy. "The Clothesline Swing" is his first novel in English; he has previously authored two collections of short stories in Arabic. His history of working with organizations in the Middle East as well as his personal experience as a Syrian refugee have made Ramadan passionate about democracy, social justice and LGBTQ refugees’ rights, and he was the Grand Marshal for Vancouver’s Gay Pride Parade 2016. Danny will read from "The Clothesline Swing", a journey through the troublesome aftermath of the Arab Spring. Noor Kanj Noor Kanj was born in 1990 in As-Suwayda, Syria where she studied computer science and economics. Because of the war, she transferred to the private International University for Science and Technology in Damascus. She left Syria and moved to Lebanon in 2014. In 2016, she came to Germany on a literature scholarship from the Heinrich Böll Foundation. 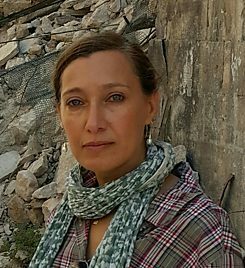 Her poetry has been published in the Arabic-language anthology "Neue Syrische Dichtung" and in the German anthology "Weg sein – hier sein". She will read recent poems including "Who will return my home?". © Pierro Chiussi Galal Al-Ahmadi was born in Saudi Arabia in 1987 and is one of the most well-known, award-winning poets of Yemen. He has also worked as a journalist and editor for various Arabic newspapers and magazines. He was a literature scholar of the Heinrich Böll Foundation until September 2016. 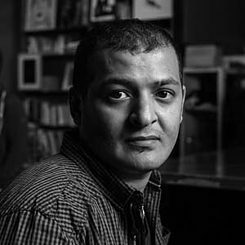 Galal Al-Ahmadi has previously published four poetry books in Arabic, most recently "The Steps of the House Descend Alone" (2015). In addition, a selection of his poems appeared in the anthology "Weg sein – hier sein". In Toronto he will read recent poems including "At home". In August 2017, he received the prestigious Mohammed Afifi Matar Prize, which is awarded in Cairo. He applied for asylum in Germany in 2016. Svenja Leiber Born in Hamburg in 1975, Svenja Leiber grew up in northern Germany and went to Berlin in 1995 to study history, literature and art history. 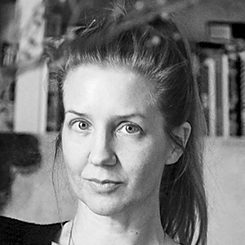 She completed her studies with a treatment of the “feminine” in Goethe and Thomas Mann and has been working as a freelance author since 2005. So far, she has published the short story volume "Büchsenlicht", as well as the novels "Schipino" and "Das letzte Land". She has received many awards and scholarships for her stories and novels, reading and research trips took her to Russia, Ukraine, Cuba, Jordan, Syria and Israel. Her writing has been translated into several languages. Ayelet Tsabari Ayelet Tsabari was born in Israel to a family of Yemeni descent. In 1998 she moved to Vancouver where she studied film and photography. Her debut story collection "The Best Place on Earth" won the Sami Rohr Prize for Jewish Literature and was a New York Times Book Review Editors’ Choice. 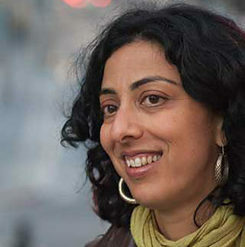 She is currently Writer in Residence at the Toronto Public Library. Heike Steinweg Mariam Meetra was born in Afghanistan in 1992 and studied journalism and public relations in Kabul. The writer and women’s rights activist is a member of Afghan PEN. 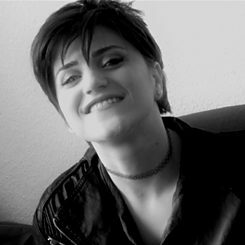 In 2013, her first poetry volume "Life on the Edge" was published (not yet published in German). She has lived in Berlin since 2015. © Zaia Alexander Antje Rávik Strubel was born in Potsdam in 1974, first trained as a bookseller and then studied literature, psychology and American studies in Potsdam and New York. While studying in New York, she also worked as a lighting technician at an off-Broadway theatre. She became known in 2001 when she received the Ernst Willner Prize at the Klagenfurt Literaturtage. Other awards include the Roswitha Prize and the Hermann-Hesse-Preis. Her episodic novel Snowed Under, set during the chaotic period following the fall of the Wall, is available in English. 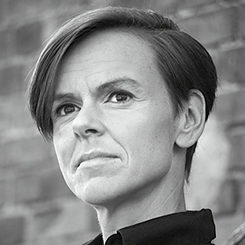 Antje Rávik Strubel lives and works in Berlin. © Nelofer Pazira Nelofer Pazira is an award-winning Afghan-Canadian filmmaker, journalist and human rights activist. The acclaimed feature film Kandahar (Cannes 2001) was based on her real life story. Nelofer co-produced, and co-directed Return to Kandahar, which won the 2003 Gemini award. She wrote and directed Act of Dishonour (2010), a dramatic feature film about honour killing and the plight of returning refugees in Afghanistan. 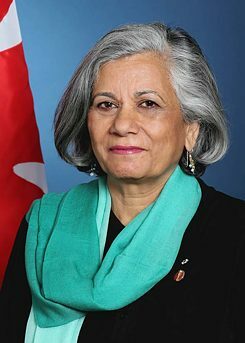 A former president of PEN Canada, and founder of Dyana Afghan Women’s Fund, she is a regular contributor to European, Canadian and other international media including The Guadian, The Indipendent and Nexus. Nelofer has traveled widely in the Middle East, covering the Arab revolutions, and has spent many months in Syria writing and broadcasting on the civil war. She assisted UNESCO as a cultural ambassador in their work inside Afghanistan and in 2009, Nelofer represented Canada in Europe as a cultural delegate accompanying then Governor General Michaelle Jean. 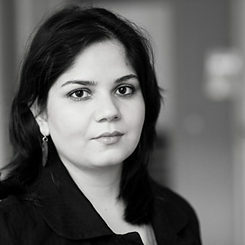 She won a Canadian literary award for her biographical work ‘A Bed of Red Flowers: In search of my Afghanistan.’ Nelofer is an Afghan, born in India where her father was then working with the World Health Organization. She grew up in Kabul during the ten years of Soviet occupation before escaping with her family to Pakistan in 1989. From there, they immigrated to New Brunswick, Canada, in 1990. She is currently working on a new documentary about journalism and the Middle East. In this video installation, documentary filmmaker Philip Scheffner stretches out cellphone footage that Irish tourist Terry Diamond shot from the deck of an ocean cruiser of a damaged refugee boat so that three minutes became ninety.